Impingement Syndrome: Two Boneheads Video - Jeffrey H. Berg, M.D. Impingement syndrome is one the most common sources of adult shoulder pain. 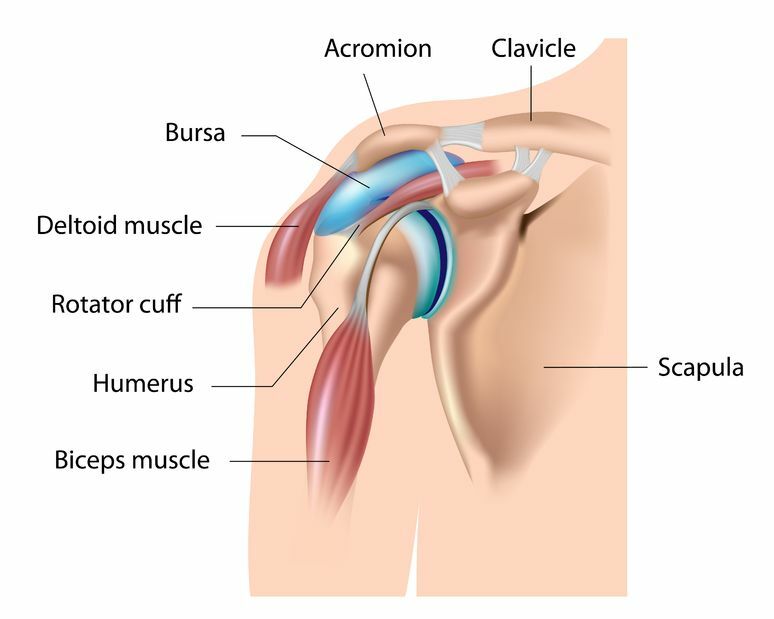 Traditionally, it was thought that a spur on the undersurface of your acromion (the bone that makes up the roof of your subacromial space) dug into the underlying rotator cuff. First, causing impingement syndrome and then later rotator cuff tears. More recently, we have come to realize that impingement syndrome is not so much due to “the roof” coming down, as it is to “the floor” coming up. What do I mean by this? Well, for various reasons, the humeral head, which is covered by the rotator cuff and essentially makes up the floor of the subacromial space, can, at times, elevate excessively. This reduces the subacromial space, leading to the bursa, that rests on top of the rotator cuff, getting irritated and inflamed. 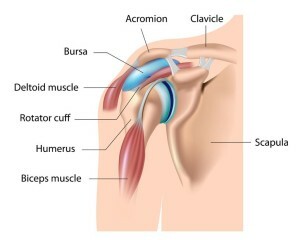 This, along with degeneration of your rotator cuff, causes the pain found in impingement syndrome. Impingement Syndrome: Why does the humeral head rise up? There are several reasons that your humeral head may rise excessively. Sometimes with increased shoulder use, our rotator cuff may fatigue. This often occurs when we overdo activities above our head or use our shoulders more than usual. Similarly, fatigue of other shoulder muscles may require your rotator cuff to work harder. This may ultimately also lead to rotator cuff fatigue. Either way, when the rotator cuff weakens, it can’t function normally. As a result, the humeral head may rise. Likewise, as the rotator cuff ages, and becomes degenerated (“tendinosis“) or when it tears, it also may not have the usual strength and endurance. So it can also fatigue early. Finally, tightness of the inner lining at the back of the shoulder (posterior capsule) can lead to the humerus rising higher during certain motions than it normally would otherwise. This tightness is seen as a difficulty reaching behind your back and is a very common finding in impingement syndrome. So common, that it’s absence calls into question whether impingement syndrome actually exists. My colleague, Dr. Howard Luks, and I differ a little on our opinion as to the main source of pain in impingement syndrome (Dr. Luks – tendinosis, me – bursitis) but we both agree that the primary problem is not that the roof (spur) comes down. Watch the following video as The Two Boneheads, Dr. Luks and I, discuss this common shoulder problem. For additional information about this problem, read some of my other posts on impingement syndrome. You can learn about what impingement syndrome is, it’s common symptoms, how to treat it and what the surgery for this problem is all about. Great video and controversial topic. A recent (11/20/17) study by Dr Beard in Lancet:(http://dx.doi.org/10.1016/S0140-6736(17)32874-X) talks about this very thing! So I just had R shoulder arthroscopy, achromioplasty, SAD, DCE and complete RTC repair. I’m still in the acute p.o. healing (6 weeks out). I tried the 3 things Dr Berg mentioned but sometimes it is not practical to stop the painful activity. I’m an aka (above knee amputee) and been in a wheelchair since 2001. I have Stage IV CA and Fx my R hip (BM 75% infiltration with CA) (amputation is on L) so I literally had no leg to stand on! I had to use my arms as my legs. So in addition to using a wheelchair for 15+ years my shoulders were being used as God did not design them to be used. The constant pain was keeping me from functioning. I’m so glad my surgeon did those procedures as the pain is already so much better! So if indeed the “floor comes up” instead of the roof coming down what are potential Tx’s? The result is the same – less space ∴ impingement syndrome. I fully agree that if removing the spurs off the acromion do not increase space (lessen impingement) then why subject the Pt to unnecessary surgery, anesthesia etc. But currently that is the way to increase space in the joint. What is the alternative? I’d love to see your ideas for Tx both shoulder tendinosis and bursitis because other than stopping activity in the joint and trial of anti -inflammatory medications and possibly steroid (with bupivicaine) injx there doesn’t seem to be many alternatives. It’s great theoretically to say to a Pt “if it hurts don’t move it” but unfortunately life is not that simple. God Bless your continued efforts to educate and change clinical practices.